Dr. Craig Goldin, Dr. Marcy Goldin, and Dr. David Whalen perform the latest dental treatments. To offer you top-quality restorative care, they proudly provide implant-supported dentures at their Troy, MI, practice. These restorations will replace all or most of your teeth. And because they will be permanently attached to stable implant posts, they will never slip out of place. Implant-supported dentures can provide you with great aesthetics, an improved quality of life, and a greater sense of confidence. In addition, when you receive implant-supported dentures at the Cosmetic Dentistry Institute, the implant posts will help maintain your existing healthy jawbone structure. Dental implants are an outstanding way to stabilize dentures for greatly improved comfort and function. Dental implants are small titanium posts that are surgically placed inside your jawbone. Therefore, if you are considering implant-supported dentures, it is vital that you have enough bone tissue to support the posts. To determine your eligibility for treatment, the doctors at Cosmetic Dentistry Institute will take x-rays and digital scans of your jaw. With these images, they can determine whether you have suffered too much jawbone recession to undergo implant surgery. Fortunately, even if you have lost a lot of bone tissue, you may still be able to receive implants after bone grafting surgery. Because the implants will replace your dental roots, your denture will be virtually as stable as natural teeth. Your dentist will also consider your overall health history and any chronic conditions that may affect your candidacy for implants. Prior to your surgery, your dentist will numb your gums and jawbone. In most cases, we will also provide IV sedation, which places you in a twilight sleep throughout your entire procedure. To begin the surgery, your dentist will create small incisions in your gums, through which he or she will position the implants in your jawbone. You will require several implants to support a full-arch restoration. In many cases, your dentist may be able to secure your denture with just four implants per dental arch. In other situations, however, you may need additional posts. After implant surgery, complete integration of your implants with your jawbone will usually take between four and six months. Once your jawbone has healed around the implants, and they have taken the place of your tooth roots, your dentist will attach your denture. All of our prosthetics are custom-made from advanced materials. As a result, they will be almost identical to your natural teeth. For patients who are missing many or all of their teeth, we can help! As Dr. Goldin says, "we are fortunate to be living in a time where teeth can be replaced with dental implants." 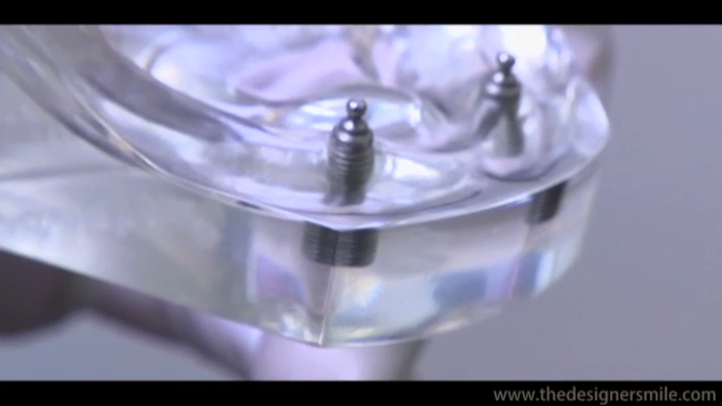 In this clip we spell out the "advantages" of dental implants to our patients. Implant-supported dentures offer many benefits for your appearance, oral function, and health. Because the implants will replace your tooth roots, your denture will be virtually as stable as natural teeth. In contrast to traditional dentures, they will never slip out of place or affect your ability to eat your favorite foods. Your implant-supported denture will also look more realistic because it will sit directly against your gums, conforming to the contours of your mouth. Finally, dental implants promote lifelong jaw health. By replacing your tooth roots, they will send the same regenerative signals to your jaw that trigger your body to send nutrients to the surrounding area. In this way, your implant-supported dentures will prevent visible jaw recession and further tooth loss. We encourage you to learn more about the benefits of implant-supported dentures and find out if this type of restoration is right for you. Contact the Cosmetic Dentistry Institute today to schedule an appointment.